E. DENNIS, MASS. — Eldred’s three-day Americana sale August 1–3 included more than ten works by Ralph Cahoon Jr (1910–1982 ) and his wife Martha (1905–1999). Topping the selection was “On The Shore For Repairs,” a busy scene with several sailboats and mermaids. It had never been available on the open market, having been purchased by the consignor’s parents in 1970. It brought $156,000 from a phone bidder, underbid by a woman in the room. She said that she has other works by the artist and is on the board of the Cahoon Museum of American Art in Cotuit, Mass. Another of Cahoon’s works, “The Lobster Pound,” sold for $90,000. 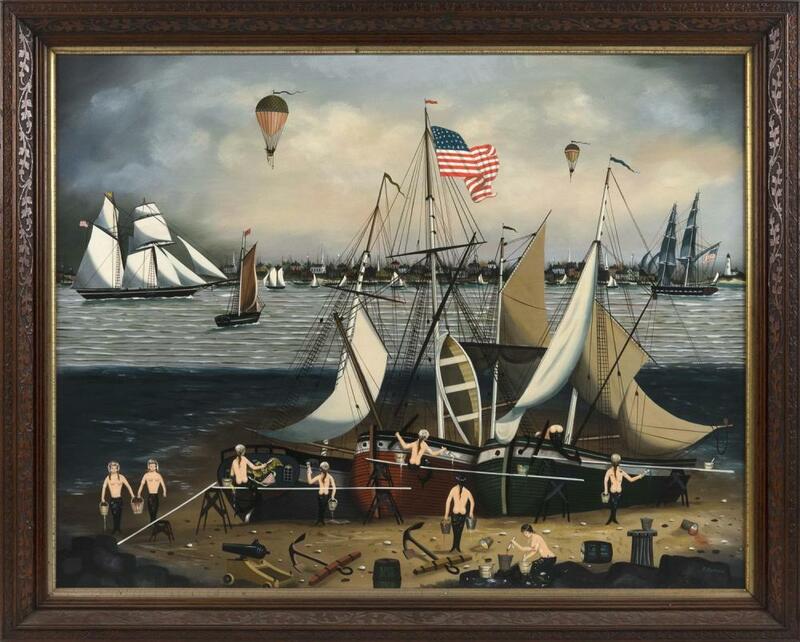 It depicted several sailors and mermaids at a clambake, with a dog eating lobsters. The sale included a selection of John Fitzgerald Kennedy memorabilia and a wide selection of marine arts, Americana and more.